Perpetuus, you may want to drop and reset your subframe, that's why your stearing wheel is so off. Even if you get an alignment to fix the steering wheel position, your geometry will be off. Try loosinging all the subframe bolts (without pulling them all the way) and getting it to a more neutral position. Also, I'm sure you know, but all of those bolts are one time use stretch bolts. They need to be replaced everytime you pull them. Are you running two piece rotors? I went for the 355x32 two piece. You should save more weight going with 328. I am going to try to redo the lower control arm bolts at the pivot point. 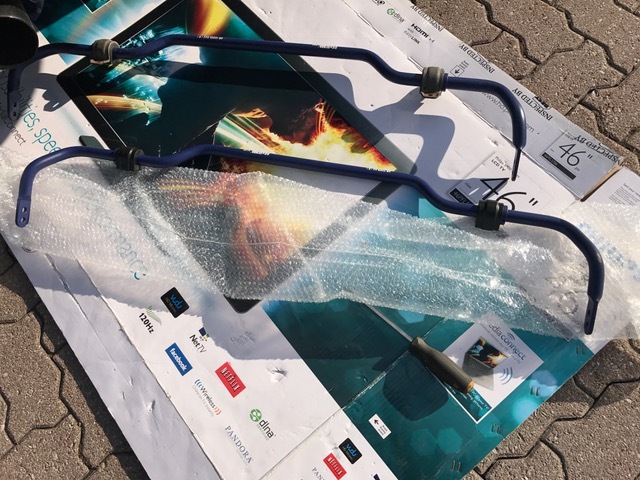 In the repair manual, it says to tighten them in curb weight position -which I did, but maybe it was not accurate enough. 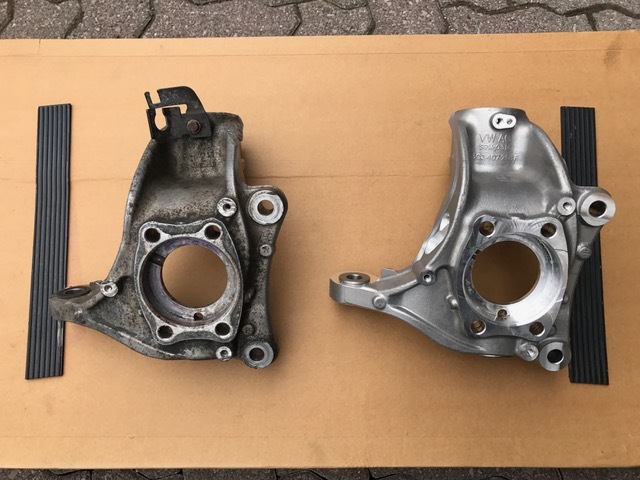 I have the Tyrolsport subframe collars previously installed (partially- 4 of the collars only), so there isn't much slack in the subframe positioning at all. Lol. So I went back to redo the control arm pivot bolts more carefully. The result? The steering wheel is now crooked to the left by 45 degrees (instead of to the right by 45 degrees). Before tightening up the control arms, the control arms can be easily wiggled in and out (toe-in or toe-out). It looks like there is a good 5 to 7 degrees of allowable tolerance. Ouch, lol. I wish I still had the room and tools to wrench on my own car. 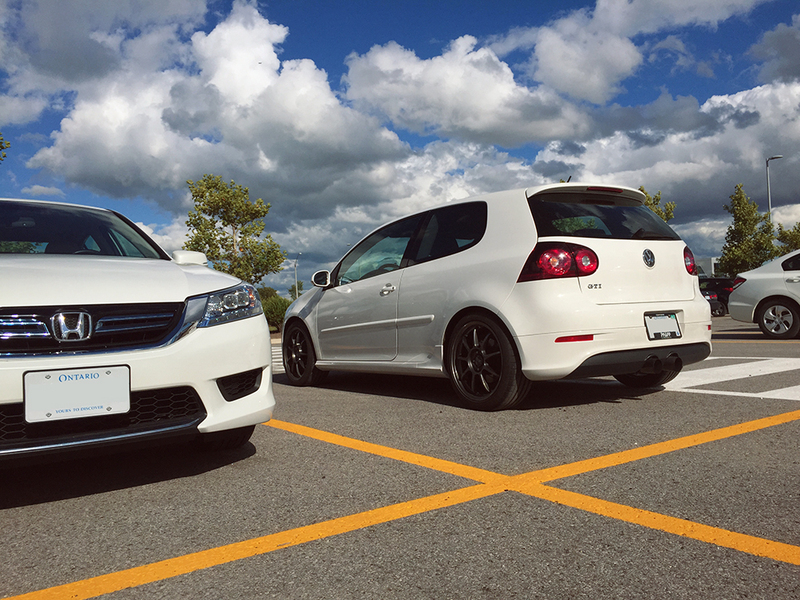 At the same time, it's nice to drop t off and come back and drive off too, haha. Last week I went for an alignment, but the front left and front right camber were off by 1 degree. I was told that the control arms or spindles were probably bent or damaged to cause the big difference in alignment. Front left camber = -3.0 deg, front right camber = -2.0 deg. Before this, my camber was -2.5 deg on both front wheels. I almost went ahead and bought new spindles and control arms, but it didn't make sense after I rationalized it a little. If the spindles or control arms or spindles were bent, it shouldn't have affected both front wheels by equal amounts (1/2 a degree each). I attempted to install the Tyrolsport collars for the subframe before, but couldn't align everything up. It ended with me installing collars for just two bolts. Heck, I even bent two of the collars the first time when I forced it without 100% lining it up first. Tolerances are tight! Anyway, my guess is that the subframe must have shifted to cause the imbalance in camber. So, it was a big day today. I went ahead to drop the subframe and install the remaining Tyrolsport collars I missed before. 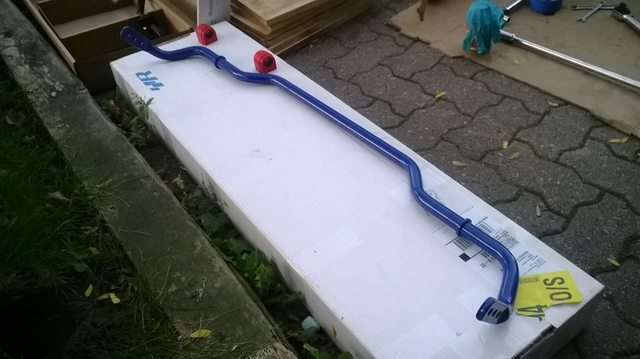 Since the subframe was dropped, I thought to install my VWR swaybars at the same time for less hassle. 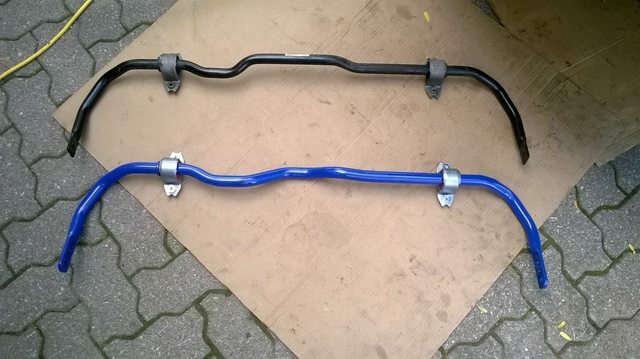 These swaybars were bought almost a year ago too. I found that almost every single bolt for the front subframe had to come out for the swaybar to be removed (like the last time I did the install). The only bolts that were left untouched were the control arm pivot bolts. Actually, with all the bolts out, it was significantly easier to push/pull the subframe every which way to line up the collars slowly. It was not easy to line everything up, but I started with the control arm rear bracket 18 mm bolts first, and left them partially installed so that the collars were properly seated (but not tightened up all the way). I repeated this step for the two stainless steel ARP bolts that replaced the black bolts at the rear of the subframe (also 18 mm). 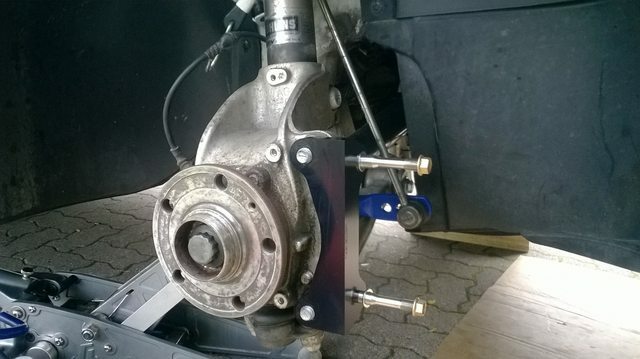 With everything loose, it was at least easier to push/pull on the brake rotors to align the subframe. What also helped was putting a jack close to the bolt I was working on, and gently lifting the subframe with the jack while I wigged the subframe in small amounts to get the collar to line up. With the subframe lowered, there was not enough room to manevour the swaybar out until the front subframe horns were free. 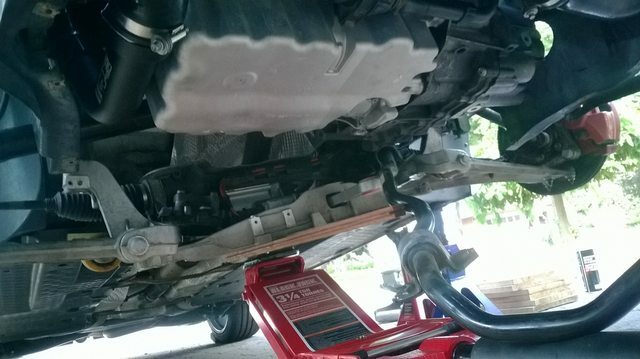 The subframe "tray" itself is not bolted up in this picture. Front swaybar, old vs. new. The reason I went with VWR is because they are 3 way adjustable, and only mildly stiffer than stock. I don't like swaybars, but at least this way I can tune the balance of the car sacrificing suspension independence too much. Front swaybar installed. 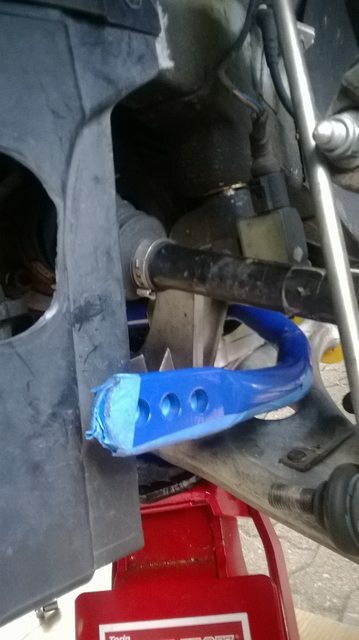 I put some tape over the swaybar before fitting it on the car. 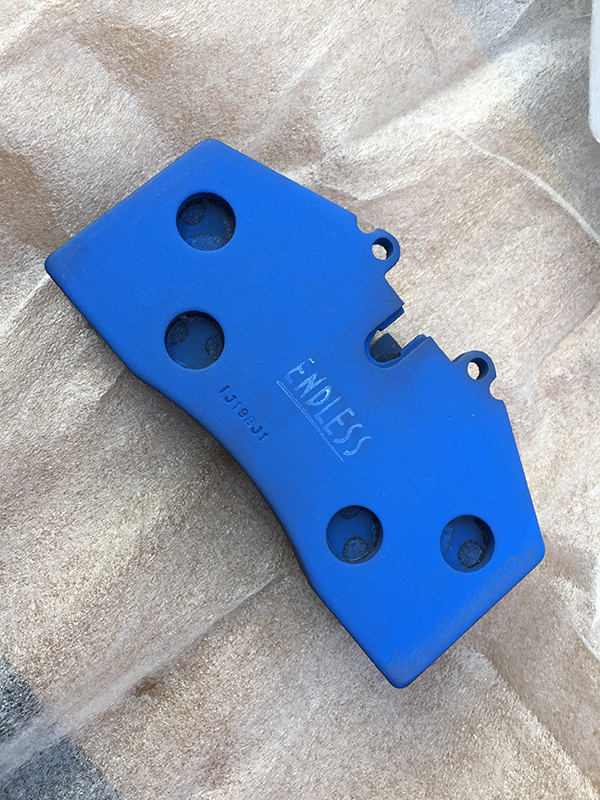 This helped prevent the paint from chipping off and eventually leading to rust. 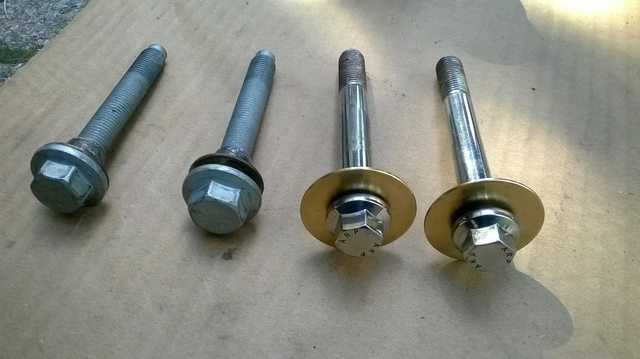 ARP bolts (on right). Delicious. 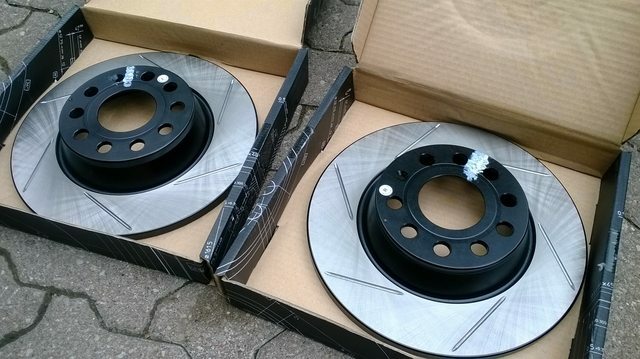 They are only a 14 mm hex drive, but were to be torqued to 90 lb-ft. This is basically the same torque as the lug bolts! 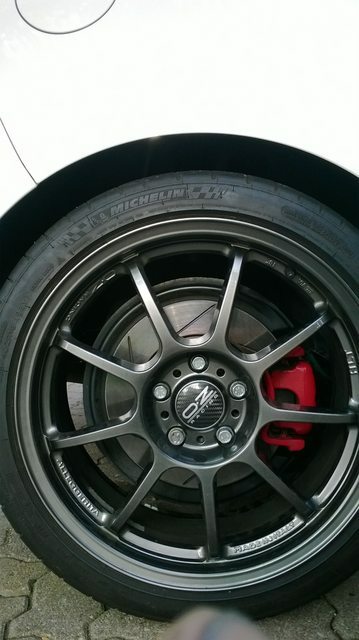 Also, installed some new rear rotors yesterday. They did not come off without a fight. I used a gear puller to pull the rotors off, and when it was free, it came flying off and landed almost 10 feet away. Wow, that's a light rotor. Are the calipers you're running 8lbs as well? 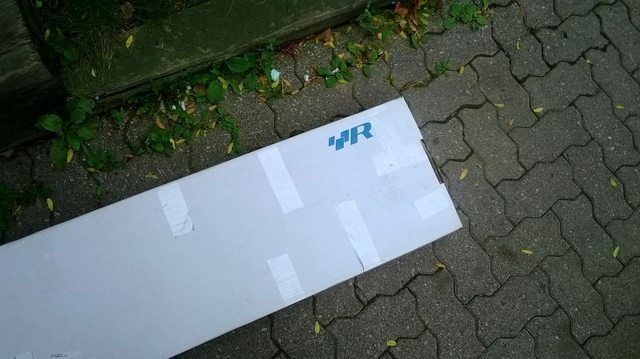 I'm looking forward to your impressions of the sway bars. The guys I autocross with have been recommending a rear bar. I probably won't get around to it next summer though, maybe the following year. Yep, calipers are 8 pounds. Well, actually, my scale shows 7.5 pounds, haha. 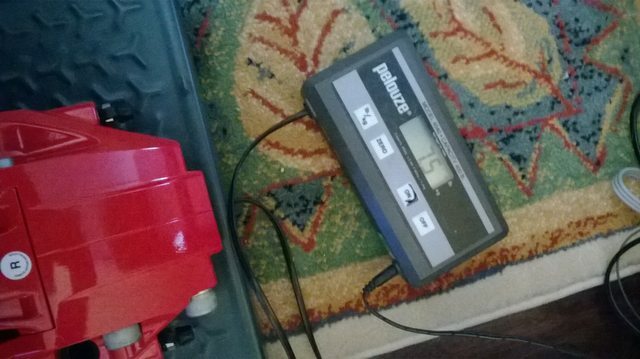 Not sure if your scale is accurate to 0.5 pounds, but I am going to say that our calipers are effectively the same weight. 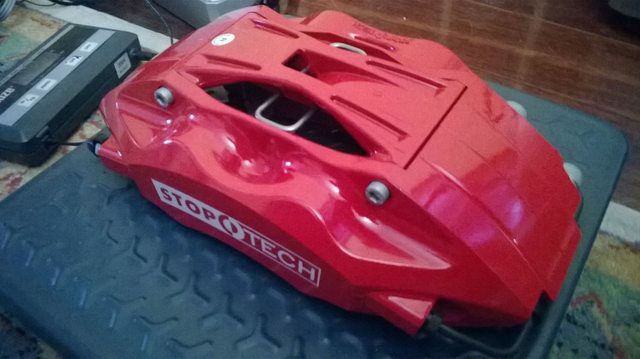 By the way, I am not completely sure how tight to install the caliper carrier bolts for the stoptech carrier. The installation instructions are generic for mk4 and "later model" VWs, and specify 80 - 90 lb-ft. 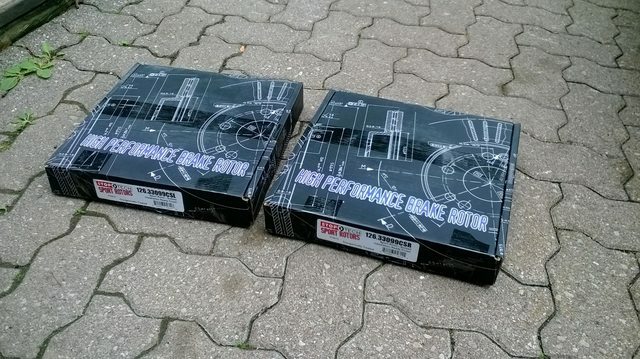 But, I know for a fact that they should be roughly 140 lb-ft for my B6 passat spindles when running the OEM setup (which is higher than for GTI stock spindles). Ya, I'd say they're the same. My mechanic had a scale lying in his shop that I used, it could display half a pound but who knows how accurate it is anymore. I think I have the same instructions too, mid-90/'s and later VR6 VW's with a picture of a MkIV Jetta on the front. It says 85-90 lb-ft. If you're supposed to torque the stock brakes to 140 lb-ft with the spindles though I wouldn't feel comfortable at the lower torque. I can't think of any reason it would damage the brackets, if anything I'd think high torque would damage threads but the spindles are rated for it so that's no concern, you have the higher compression on the brackets but I'd hope that isn't going to cause issues. 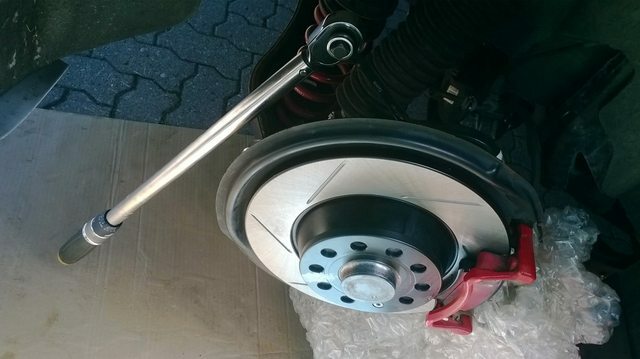 Took my time today to slowly install the big brake kit. 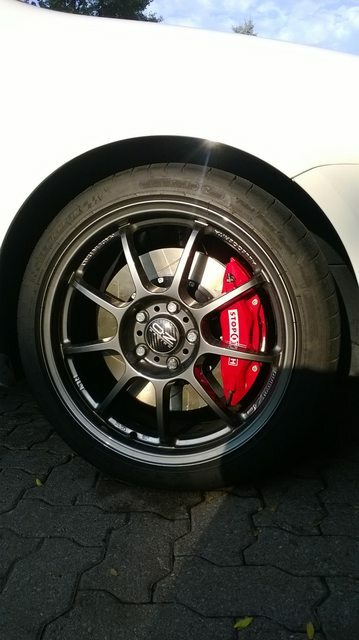 The calipers are such a vibrant red that they really stand out. They are very well designed too- just two bolts to remove the caliper bridge to change out the pads. 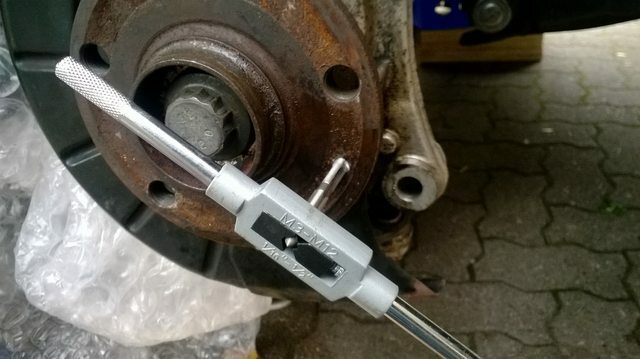 The Torx 30 bolts holding the original rotors had to be drilled out and retapped. Easier than I imagined. The previous Passat alu. spindle I bought from the scrapyard turned out to be crooked when they removed it from the car (they didn't have the strut spreader). There were impact marks from the hammering that they did. When I tried to slide it onto the strut, there was some resistance due to it being crooked. I decided it wasn't worth my time or energy to keep guessing on whether the spindle is straight. Bought a brand new one instead and also no longer have to replace the stretch bolts for this installation. Also swapped out H&R 24mm rear swaybar back to the 22mm rear swaybar. Glad you're still at it. Did you pick up the control arms too? And this is now the second time I've learned I could have run the stoptech brake kit up front. Could have bought an ST4O kit for $700, fml. Glad to see the car is still coming along and you're still going at it! How does it feel with everything you've done now? Yep, I've got the full passat aluminium front. The control arms actually saved more weight compared to the spindles. 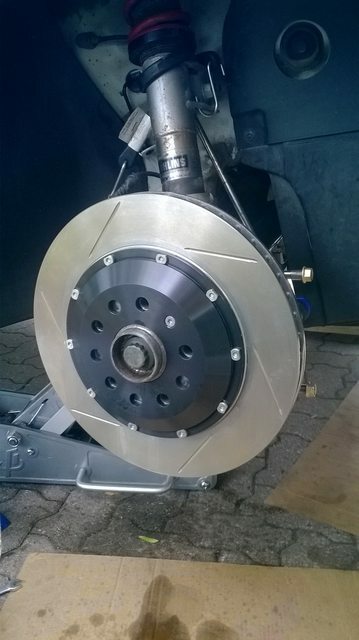 In addition to the improved braking performance and feel, the two-piece Stoptech kit is great for its weight savings in the 328x28mm rotor size. 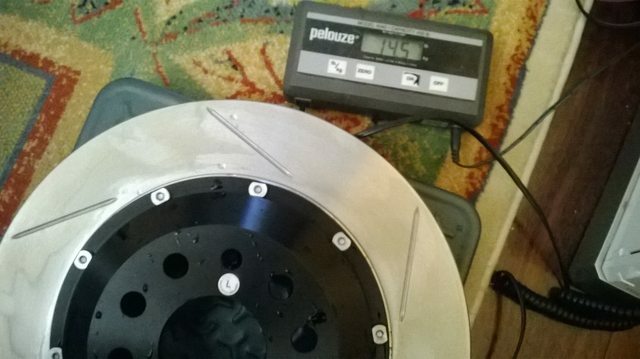 The 355mm rotor kit is about equal to stock weight. The Stoptech pads are damn awful though, and glace easily. Car runs good and is practically brand new because I had access to company cars for the longest time. 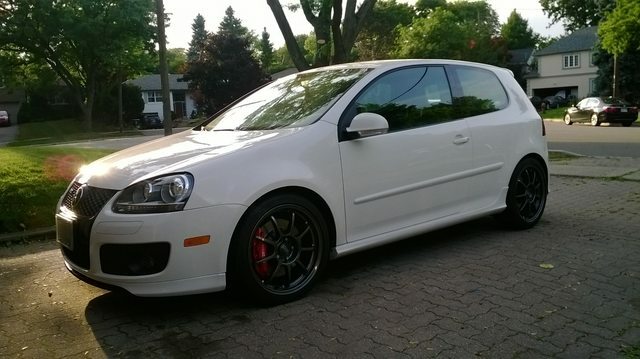 The MkV needs some work though with some electronic issues that is affecting driveability and power delivery. MAP sensor, MAP harness, or some other harness or sensor in that area of the car has some problems. Would you know where to find the electrical diagnostics manual? I've looked and had no luck. No, they glazed easily and I had brake judder alot until I swapped them out. 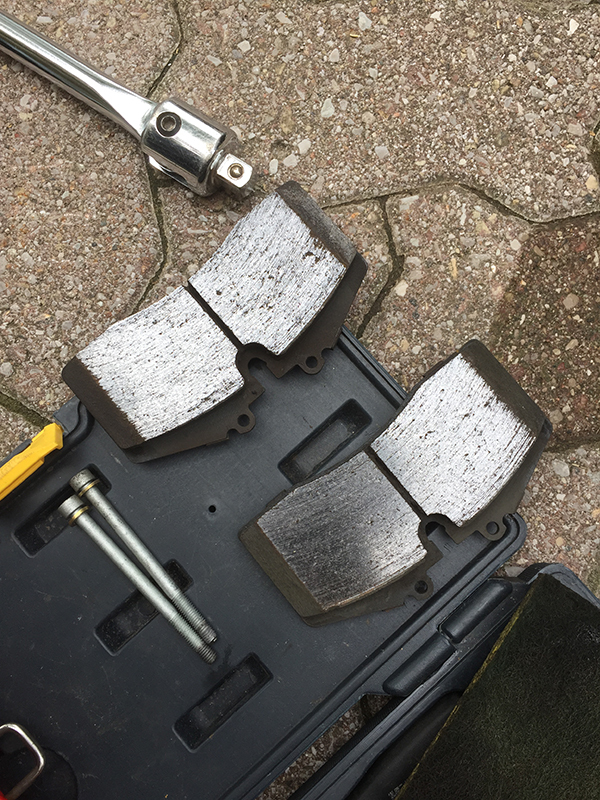 Still have them for my rear pads, but not much braking duty there so it's ok to stay. Did you use them at the track at all or purely street driving? I've gotten brake judder a couple times too but it always went away after a single lap at the track. I think the inconsistent braking of street driving causes them to transfer material unevenly sometimes. A few heavy braking zones though and it evened out, not that that does any good on the street. I only drive my car on the street. After a while it became too much work to get rid of the judder every few days. In fact, there are various occasions where they glazed and left pad imprint several times a week. Right now I am using the Endless pads - ME20 EIP001. The cost a pretty penny, but offer superb braking performance and modulation! Last edited by Perpetuus; 04-28-2017 at 08:23 PM.